Victus Soul + Jin Bo Law-double shot. START: Victus Soul, 90 Mansell Street, E1 8AL, London. FINISH: Jin Bo Law, 14th floor, 9, Dorsett City, Aldgate High St, EC3N 1AH, London. TUBE: Aldgate / Aldgate East. THE WORKOUT: Friday 18:00pm HIIT + Boxing with Tao. Remember your hardest work-out, times it by a hundred and that’s probably near the mark for this class. But Tao is all about positivity and the power of the mind, so you get through and feel unstoppable. This boxing-HIIT fusion takes you through some heart-pumping aqua-filled training bag combos combined with high intensity training on your floor-bench work station. You choose how hard you’re going to push yourself - but the work-out is tough regardless! Start on the floor to get warmed up and mobilise those joints. Then expect two rounds of eight minute floor and boxing bag sessions, staggered back to back. A final six minutes on the floor and then the bag blasts out any energy you might have left. Time off the bag features killer rounds of cardio and strength moves. Dumb-bells of varying weights (from 2kg all the way to 14kg) sit under every bench and are used throughout to add to the burn. One of the most evil combinations include dumb-bell thrusters and tuck jumps, sky-rocketing your heart-rate and burning your legs out. Moving to the bag, you need to stay focused to work through various combinations of jab, cross (1-2) hooks (3-4) and upper cuts (5-6), interspersed with some ab-work as your active recovery. If you’re worried about not following the boxing combinations there is also a screen showing you exactly what moves to follow. Half-way through your eight minute round expect aching arms, gasping lungs and a very sore core. An awesome playlist, encouragement from Tao keeps you in the zone to stick at it and make it to the end. Class ends with a really decent cool-down, gently re-mobilising and stretching with yoga moves like downward dog and child pose. We love this refreshing attitude and respect for recovery - often studios skip through it super fast - and it means that despite being sore the next day you won’t feel broken. THE DRINKS: We challenge you to keep your cocktail glass steady after battering your arms with boxing. But its definitely worth trying! At the top of Dorsett City Hotel, no less. Take in the iconic London skyline fourteen levels up with floor-to-ceiling views; you can see all the greats up here from the Shard, Walkie Talkie, Gherkin and Tower Bridge, so explore the heated rooftop terrace with cocktail in hand. Inside Jin Bo Law is pretty glitzy but at Christmas we can’t get enough of twinkling lights and gilt. The mixology maestro’s here are en-pointe and very fruity. “A Fizz from a Rose” is a fruity, fresh cocktail featuring kaffir lime, rose liquor, egg white and ginger beer. The “Butterfly Punch” is also a fragrant twist on a classic punch recipe, using Jasmine tea. “East / West Cobbler” is a total dream with vodka, elderflower liqueur and sour yuzu. Snack on nuts, and olives to keep you going. After a cocktail or two really starving marvin’s should head to Canto Corvino in Spitalfields for sophisticated Italian. Or soak up the booze and get a pizza the action at Pizza Union. FYI: The terrace closes at 22:00pm. THE PRICE: A single class at Victus Soul is £20. 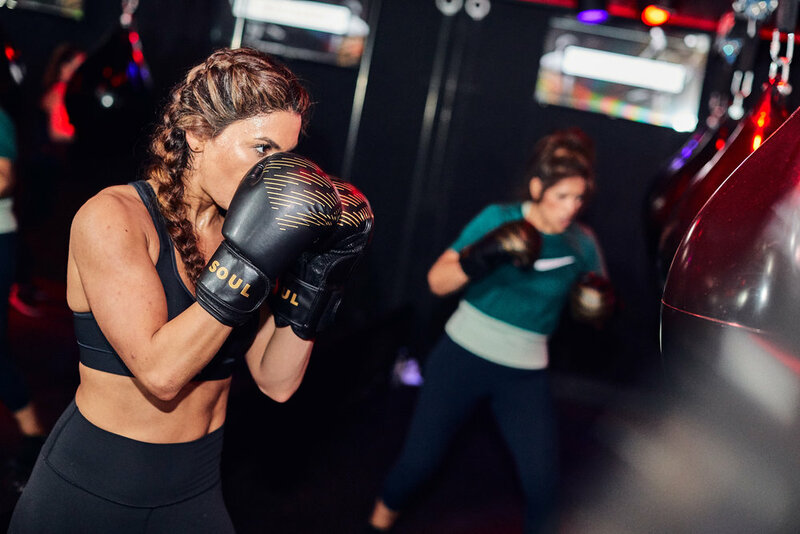 First-timers pay £25 for two classes (and you get a pair of boxing gloves thrown in!) A cocktail at Jin Bo Law is £13, glass of fizz £9.5, soft drinks £3.5. BEST FOR: Personifying the term '“healthy hedonism” and knocking Friday night out the park.